Continued, deliberate exploration of the molecular pathways involved in different subsets of the disease is crucial to achieve clinical advances in the future. Diffuse large B cell lymphoma (DLBCL) is the most frequently diagnosed non-Hodgkin lymphoma in adults. Clinical signs include the triad of “B symptoms:” weight loss, fever, and night sweats. As the genomic underpinnings of DLBCL variants become better understood, molecular testing will inform treatment decision-making — and point the way toward new treatment strategies, Dr Aguiar said. Treatment options are, however, still limited, with rituximab, cyclophosphamide, doxorubicin, vincristine, and prednisone (R-CHOP) immunochemotherapy remaining, for now, the standard of care for first-line treatment. Tumors should be tested for MYC/BCL2/BCL6 translocations, molecular subtyping for ABC, GCB or unclassifiable DLBCL (using the Lymph2Cx assay or, alternatively, immunohistochemistry [IHC]), Dr Aguiar advised. 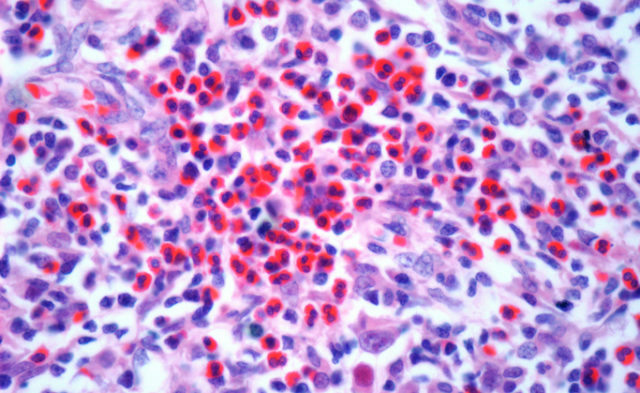 MYC/BCL expression should also be assessed using IHC. The evidence base is, however, still young, he noted: “although some of these features certainly influence treatment response and outcome, they should not per se dictate treatment strategy.